Never leave your cooking unattended. Especially if you’re frying something—that’s when things can cross the line in mere seconds. 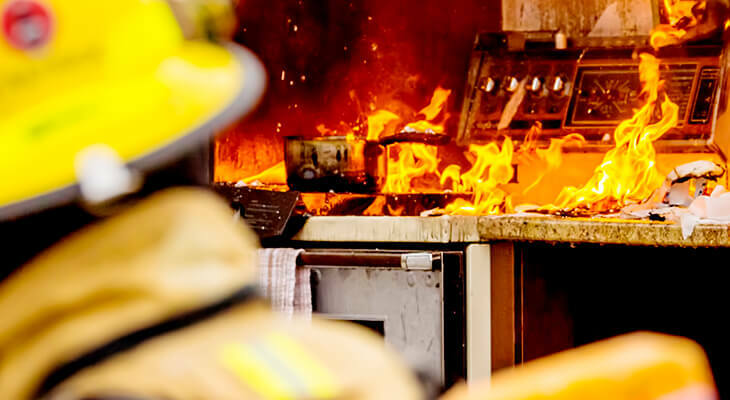 It’s one of the simplest fire safety tips, but it’s also the leading cause of kitchen fires. Keep it clean. Keep cooker and counter surfaces free of clutter, grease, and especially flammable objects like hairspray, bug spray, or air freshener. In case of an emergency you’ll be able to react faster given the freedom of space. Set a timer. Don’t just rely on your brain; we’re human, and we get distracted. A timer can remind you to switch off the burner or oven, saving your food and possibly your house from being burnt. • Covering the pan with a lid or a bigger upturned pan. • Turn the heat off. • Spray the pot with a fire extinguisher. If you’re an employer, consider a fire extinguisher training for your employees to be able to know the proper use of the device. • If you don’t have a fire extinguisher handy, douse the burning oil with baking soda. • Never run with a pan fire. You run the risk of spreading the fire further when the oil drips. • Never throw water on the pan—it will splatter the oil and spread the fire, possibly burning you. Wear fitting clothes. Billowing sleeves or hanging accessories above a lit cooker can spell disaster. Install a smoke detector in the kitchen. In a commercial environment, consider investing in fire safety training for employees.